I do not really read crime fiction very often. Although I do tend to pick up some of them often and they sit on my book shelf for quite a long time before they are picked up to be read. 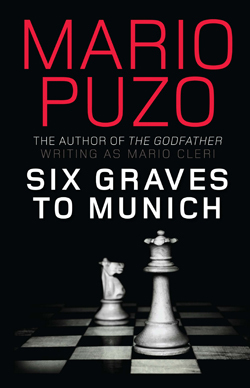 Same goes with this book, Six Graves to Munich by Mario Puzo. It had been sitting quite a while waiting to be opened and read. I had picked up from the library only because of the author's name. I have not read the author's other more known work like 'The Godfather' or 'Sicilian' but they have always been on my TBR list. So, for a start I picked up this book. The blrub from back cover of the book gives an idea of what the story is about. Seven Gestapo officers tortured Captain Michael Rogan, murdered his pregnant wife, and left him for dead. After the end of the second World War they escaped to new lives and identities. Rogan has spent the last ten years recovering from his horrific injuries and planning his revenge. Now he is back, and on the hunt for the Nazis who ruined his life. But ther is one problem, he has met and fallen in love with the beautiful Rosalie. Should he listen to his heart or continue to pursue his quest for vengeance, whatever it takes? That seems like the perfect recipe for an interesting novel. But, as the readers get on with the book, they realise that the story does not keep the momentum of thrill and suspense alive, which I think is the most important thing to look forward to in such a story. To me it seemed too straight forward with out neccesary twists and turns. However, it was an easy and sort of 'light' read. Even though murders and planning for murders were taking place throughout the novel, it was not particularly disturbing. Another way to say it is ~ it failed to make any impact on the reader. 'Six Graves to Munich' was written by the author under the name Mario Cleri. It was written before 'The Godfather'.